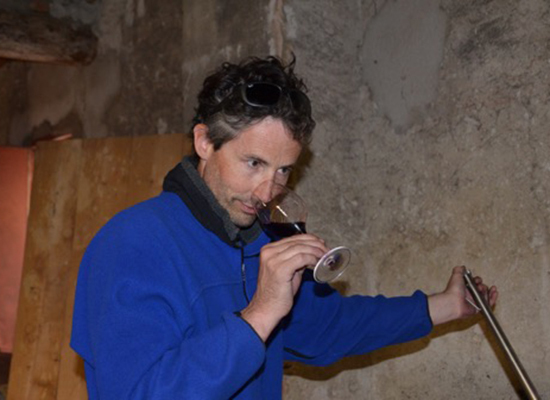 In this week's column, Andrew Jefford examines the career of Justin Howard-Sneyd, wine buyer turned winemaker. It’s a classic start: anthropology student turns cellar-rat, and goes tank-cleaning his way around France, Hungary, Romania and South Africa. While helping out a little later with the winemaking at Chapel Down in Kent, near his mother’s house, Justin Howard-Sneyd heard about a wine-buying job going at the UK supermarket chain Safeway (now Morrisons) under the respected Liz Robertson MW. She liked his winemaking experience, so took a chance on him; he thrived, completing his MW while at Safeway in just two years. From there, he was head-hunted to Sainsbury’s; no surprise when, five years later, he stepped into Julian Brind’s shoes at the head of the Waitrose wine department team. After another five years, he was re-poached to become Global Buying Director for mail-order giant Laithwaites. That would be, for most, a kind of ‘kick-back-and-enjoy’ career summit. If Howard-Sneyd had seen it like that, though, I wouldn’t be profiling him. It’s what this unusually talented wine trader did next which is really interesting. While working at Sainsbury’s, he went to stay at the Sichel family’s Ch Trillol near Cucugnan, just underneath the ridge, crowned by the austere Cathar fortress of Quéribus, which divides Corbières from Maury and Roussillon. He found the place thrilling, and I know why: there can’t be many more dramatically sited villages in France than this one. On a chilly holiday to Maury itself in October 2003, he and his wife Amanda bought a bottle of Jacques Montagné’s Clos del Rey from Jean Pla’s shop to keep warm with. ‘I loved it so much. I’d been thinking for some time that I’d like to make my own wine, and the combination of scenery and quality of wine and cheapness of the vineyards combined to make it obvious choice of somewhere to want to work.’ The following February he bought a small vineyard of old-vine Grenache in Maury. Other morsels followed, to make a total of 4 ha – and Domaine of the Bee; 2007 was the first vintage. I didn’t catch up with the wines until the 2014 Vinisud, when I tried the 2009, 2010 and 2011 vintages, as well as the ‘special cuvée’ version (called Genoux – the bee’s knees) from 2011, a wine I have tried once again in a blind tasting since. How can I put this? I expected something correct, sensible, well-made, well-packaged and commercially attractive; the sort of thing you’d imagine a moonlighting supermarket buyer would make on his holidays. Wrong: the wines are dramatically better than that. They’re wild, thunderous and unreasonable, full of the grandeur and savagery of the place. No wussy fretting about alcohol or wine-trade angst about ‘balance’ and ‘freshness’: they come hoofing out of the bottles like wild boar out of the garrigue, and root and rut gratuitously all over your glasses. ‘A tiny production of enormous reds,’ as Howard-Sneyd correctly says. In ten minutes at a Vinisud bar, he rose in my estimation enormously. Now he’s done it again. That Chapel Down acorn had secretly spread roots and grown: Howard-Sneyd began to think that an English sparkling wine would be a good complement to his Roussillon wines. But there was a problem. ‘A reasonably good old-vine vineyard in Roussillon is about €10,000 per hectare. And that’s planted and producing. Farmland in the right places in the UK is about £8,000 an acre – so that’s £20,000 a hectare just for the land, and you’d need to spend another £30,000 on planting it and trellising it and working it for six years.’ He decided to go base-wine shopping instead, and create his own vineyard-less English sparkling-wine blend. That was a clever move when he did it in 2010 – and it looks still more astute now. English sparkling wine sells about two million bottles a year, and the last few years have seen enough vineyards planted in the UK to make three times that. There will be a multitude of grapes and wine looking for a home before long. Luck plays its part in every success story, and Howard-Sneyd was surely lucky to find base wine of the quality he did for the initial 2010 version of his Hart of Gold sparkling wine, now on the market. It has truly impressive aromatic complexity, billowing with white orchard fruit, brioche and a little oxidative richness; the flavours are rousing, long and perfumed too, with splendidly ripe, resonant acidity. It was grown by the Chinn family in Ross-on-Wye whose own label – and very elegant it is too – is Castle Brook; the winemaking and ageing was carried out at Ridgeview (‘fantastically good straightforward easy people’). There are more vintages of Hart of Gold in progress (though not 2011 or 2012), based on Chinn-grown Ross-on-Wye fruit, but Howard-Sneyd doesn’t rule out expanding the blend. Of course he doesn’t. Champagne, remember, isn’t just about chalk. Champagne is also about creating pan-regional blends based on purchased fruit and wine, and enduring brands based on consistency. Who might be better placed to deliver something similar for the UK than a hugely experienced ex-Sainsbury, ex-Waitrose and ex-Laithwaites buyer and MW? (Actually he’s not ex-Laithwaites: he still consults for them). No less interesting is that Howard-Sneyd decided to market his wines himself, principally by direct marketing – and has succeeded in doing this as skilfully and innovatively as everything else, with copious fun and humour. Domaine of the Bee mailshots are little deleted and much read, even by those who don’t buy. ‘To me it’s a no-brainer. In fifty years’ time, a large percentage of the great estates in Europe will sell their wines directly to consumers in the way that Napa estates already do.’ He’s done it successfully enough himself, tracking down many of the specialist service providers needed to do it, to be able to advise others on direct marketing. I’m sure there’s something that this cool, clear-headed wine creator does badly – but I’ve no idea what it might be. If he ever goes looking for crowd-funding, I’m in.